No need to look any further than our roundup of bridal heaven. @harrisonvalencia is our Cape Town branch Manager and Designer ?????? Tucked away in a cosy corner on Cavendish Street in Cape Town, this intimate boutique is a stockist of Maggie Sottero, Pronovias and La Sposa wedding gowns. For the Johannesburg bride, there’s a branch in your hometown too, where you can relish trying on gowns by Maggie Sottero. Dresses range between R15 000 and R45 000 to buy, R9 500 and R12 500 to hire and are available in US sizes 6 to 20. During your appointment, at a fee of R250 for a 1 hour-long consultation, you can try on as many dresses as you’d like. If you prefer something more personal, owner Eve Levinsohn, a veteran fashion designer, can create one for you from scratch, for R15 000 to R35 000. 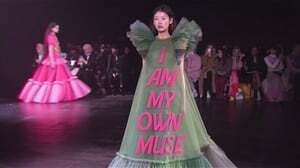 She can also do alterations and customisations to make an off-the-rack dress unique to you. The boutiques also stock a wide range of accessories to complete your ensemble, including Anella Wedding Shoes. Bring your mom and retinue to have a look at their bridesmaid, mother of the bride and flower girl frocks and that’s it- everyone’s sorted. Trading hours are the same as above. If you find yourself in Johannesburg, Port Elizabeth or Bloemfontein, remember to pop into Olivelli. With their extensive collection of dresses, you’ll be spoilt for choice! At the Johannesburg head office, you’ll be spellbound by the gowns of Maggie Sottero, Sottero & Midgley, Rebecca Ingram, Essence of Australia, Stella York, Kenneth Winston, Gallery, Ella Rosa and Modeca. Goodness gracious. At the Port Elizabeth outlet, you can find frocks by Maggie Sottero, Rebecca Ingram, Essence of Australia, Stella York, Kenneth Winston, Emmerling, Rainbow Club and Sorella Vita. As if that wasn’t enough, you’ll see most of those designers’ works on the rails of the Bloemfontein outlet, plus dresses by Le Papillon. Their price range is R12 000 to R40 000 and gowns are offered in US sizes 6 to 16. 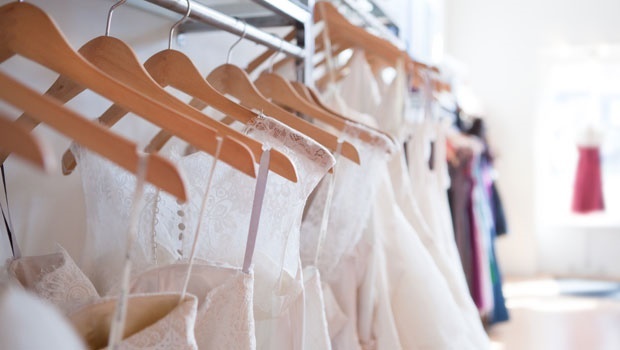 Gowns are not hired, but if you’re a lucky Johannesburg bride, you could strike a bargain at their current sale, with a starting price of just R3000. A 90 minute-long fitting comes at a price of R300 on weekdays, R350 on Saturdays, and there’s no limit on the number of dresses you can try on. Should you discover The One, R100 of the fitting price is refunded. In need of alterations? They’ll take care of it. Apart from the dresses, what really stands out about this boutique is their range of bridal lingerie by international brand Poirier. Pamper yourself with a set of these luxe undergarments and you’ll make your hubby-to-be a very happy guy. This is SA’s only bridal department store, with a whopping 10 branches around the country. However, 3 of them are boutique stores. Bride&co exclusively stocks Oleg Cassini and Viola Chan’s creations, and has two in-house brands, Bride&co Collection and Curves. You stand the chance of saving quite a few bucks, since their wedding dress starting price is only R5 400, with the priciest dress retailing for R23 000. If you buy a Special Value gown, you could pay as little as R2 000. Not to mention the White Sale and Birthday Sale, which happen in February and July each year respectively. Sizes begin at a US size 2 and go all the way up to 16. However, they do cater for fuller-figured brides with selected dresses provided in sizes 18 to 26. If for any reason your dress isn’t the perfect fit, there are dedicated seamstresses who do alterations and tailor the detailing to suit your style. They’ll even help you pick out fabric! Fittings are free and the number of dresses you slip on is unlimited! They last for 1 hour and walk-ins are welcome, although it is preferable that you book an appointment, especially on Saturdays when they get really busy. Half the store is devoted to mother of the bride, bridesmaid and flower girl garments. Their brother store, Eurosuit, ensures that the gentlemen are decked out in swish threads. Department stores are in Boksburg, Parkview and Rivonia in Gauteng, Canal Walk in the Western Cape, Bloemfontein in the Free State, Crescent in Kwa-Zulu Natal and Nelspruit in Mpumalanga. Boutique stores are in Brooklyn, Clearwater Mall and Rosebank in Gauteng. Table View Mall is home to this authorised seller of Oksana Mukha, San Patrick, La Sposa, Love Bridal, Love Bridal Plus Size, Cristana Carrera, Veromia, Sonsie by Veromia, Hadassa, Always Pretty White, Vestelli and Enzoani Blue’s wedding frocks. That’s a mammoth variety of frocks to choose from! You have the option of buying a gown that’ll cost between R3 000 and R35 000, or hiring one that’ll cost between R5 000 and R12 000. Unlike many other boutiques, Bridal Allure follows the UK sizing system, offering dresses in sizes 4 to 14 and for the plus size brides, sizes 16 to 28. You can browse through the rails at your own leisure, although fittings require an appointment, at a fee of R200. They last for 90 minutes and you can try on as many dresses as you can squeeze into during that time. If you book a slot at 9h30 on any weekday, or decide to buy a dress, your fitting will be on the house. If any alterations need to be done, just leave it to them. Infinity dresses are becoming incredibly popular, and Bridal Allure has a selection of them for bridesmaids and even flower girls. A substantial collection of high-end evening dresses, from designers including Tarik Ediz, is on offer too. When paying a visit to one of De La Vida Bridal Couture’s 2-story boutiques, you’ll be surrounded by the dresses of the global frontrunner in bridal fashion, Pronovias. Pronovias has several wedding dress ranges, and each of the 2 outlets sell different ranges. The Pronovias, Atelier Pronovias, La Sposa and Avenue Diagonal ranges are stocked at the outlet in Sandton, while the Fourways outlet stocks the Pronovias, San Patrick and White One ranges. These premium collections are not available for hiring, and are priced between R15 000 and R50 000. They are available in US sizes 8 to 14, but can be altered in-house so that your choice fits you like a glove. You are free to cruise through the store without an appointment, although it is preferred that you book one. You’ll be charged R150 for a 90-minute appointment, with no restriction on the quantity of dresses you fit on. Their array of accessories is pretty broad, and includes additional garments such as petticoats and boleros. To add to that, is a collection of bridesmaid dresses in 43 different shades. These also come in lace, but only in specific styles. This Pretoria-based boutique is a haven of dreamy luxury where you can find both brand new and pre-loved dresses alike. Those dresses already worn are bought back only from former clients, and are in tip-top condition. The designer brands stocked are among the crème de la crème of bridal fashion brands. They consist of Pronovias, Maggie Sottero, Sottero & Midgley, Justin Alexander, Sweetheart by Justin Alexander, Lillian West, Sincerity, Sophia Tolli and David Tutera. Gowns are priced between R10 000 and R45 000 and come in US sizes 6 to 16. Although the option to hire a gown is not available, you can be gentle on your bank account by picking out a secondhand dress for between R5 000 and R35 000, or a dress on sale, selling at R5 000 to R10 000. Bear in mind that they work strictly by appointment only. An appointment fee of R300 is payable via credit card or EFT in order to secure a booking. This entitles you to a 90-minute fitting and there is no maximum number of frocks that you can dress yourself in. If you decide on a dress but discover that it needs alterations, Bridal Manor will see to it that they get done. A rather nifty accessory that they stock is detachable cap sleeves. These lil’ beauties can be used to jazz up a plain dress or slightly modify the dress to appeal to your taste. 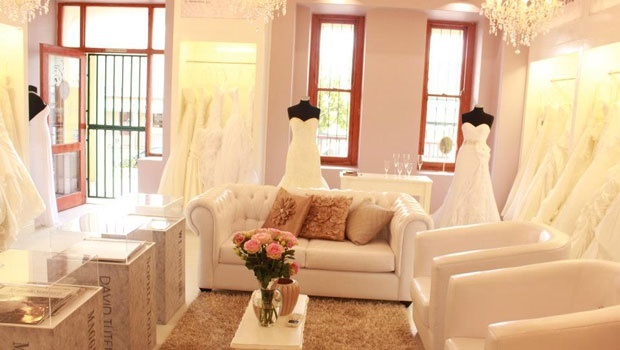 This wedding dress establishment is one of the few in South Africa that retail Modeca’s designs. These are sold alongside the MillaNova and Blue by Enzoani collections. Dresses are between R17 000 and R40 000 to buy, although you may unearth a more budget-friendly possibility on the sale rail, costing between R8 000 and R14 000. You could also hire a dress for R17 000. If you’re a plus size bride in search of the ideal frock to adorn your curves, you can’t afford not to take a trip to Vonvé Bridal Couture. With gowns available in a US size 6 right up to a size 40, you’re sure to spot something that tickles your fancy. A consultation is priced at R280 and lasts for 90 minutes, during which you can fit on as many gowns as your heart desires. If you find your match, but understand that it needs a bit of nip ‘n tuck, just leave your worries to them. With branches in Cape Town and Nelspruit, this boutique will have you covered whether you’re up north or down south. They retail 2 collections from Enzoani, namely Blue by Enzoani and Beautiful by Enzoani, together with gowns by Maggie Sottero and Sophia Tolli. Dresses are sold for R14 000 to R26 000, although if this doesn’t suit your pocket, you might choose something on sale, selling at R4 000 to R14 000. Another option would be to a rent a dress for R7 000 to R13 000. Their size range starts at a US size 4 and continues up until a size 16. If however you see that your dress could do with some adjustments, Ever After Bridal will gladly sort it out. To spare some cash, try to schedule a fitting during the week. You’ll be charged R200 for a 90 minute-long appointment, instead of R200 for a 1 hour-long appointment as is customary over the weekend.